(by Seth Lipsky, NY Post) – Remember Reykjavik. That’s my advice to those [criticizing] President Trump’s decision to walk away from President Barack Obama’s nuclear deal with Iran. Reykjavik was the site of a summit in Iceland where, in October 1986, a nuclear-arms deal was offered by the Soviet party boss, Mikhail Gorbachev. Ronald Reagan stunned the world by walking out. It turned out that his move set up our victory in the Cold War. 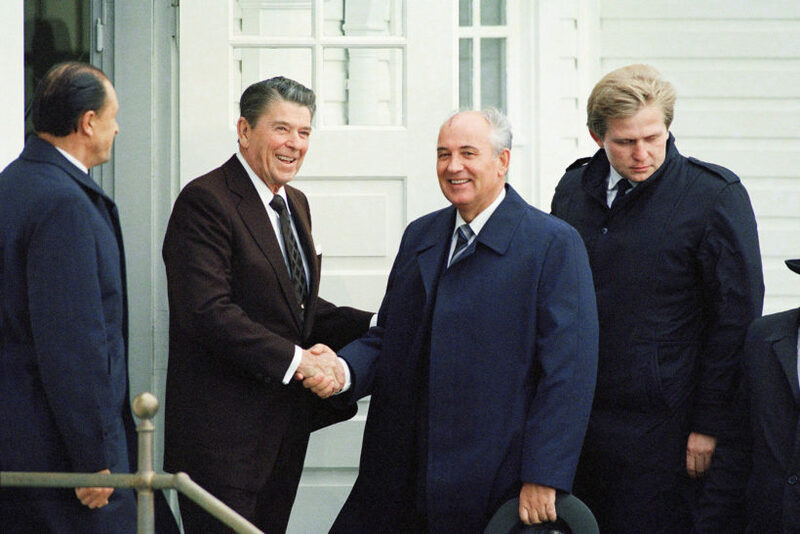 Reagan faced enormous pressure from a nervous world to get a deal from the Soviet camarilla [leaders]. Just the way the Europeans have been pressuring Trump to stick with the Iran appeasement [giving in; giving something to the other side that they have demanded to prevent further disagreement; to stop their anger or threats by giving in to their demands]. France’s Emmanuel Macron went to Congress to plug for appeasement. Britain’s Boris Johnson made a plea to Trump, as did Germany’s Angela Merkel. They were prepared to improve — or expand — the deal. They were, though, desperate for Trump to stay in the confounded compact, lest we irk the Iranians. That’s just what the Times did when Reagan — in a move that caught even his own staff flat-footed — stood up and walked out of Reykjavik. “What happens next?” the Times asked. Not even Reagan knew, of course. He did know that he wasn’t prepared to do a deal that wasn’t right for America and was contrary to his campaign promises. Those points are captured in an evocative short film about Reykjavik that’s part of PBS’s “American Experience.” It shows the incredible intimacy of that summit. It took place in an isolated building, nothing like the palaces ex-Secretary of State John Kerry favored. Reagan, Gorbachev, two translators and a few aides were crammed into a tiny room. The issues, though, were huge. The Soviets, as PBS relates, suggested both sides destroy half of their long-range bombers and missiles and eliminate all missiles threatening Europe. The next morning, though, Gorbachev had one catch. He wanted us to restrict our work on our Strategic Defense Initiative anti-missile defense system [SDI; Star Wars]: No testing. Reagan refused. His chief of staff, Don Regan, suddenly sensed the president was growing restless, wanting to get back to Washington in time for dinner with Nancy. Restricting our Strategic Defense Initiative [SDI] to the lab seemed an odd condition. Particularly after America countered with a proposal to ban space defenses for a decade, during which both sides would eliminate all their long-range nuclear missiles. And he was right not to — the Soviets so feared the arms race that they spent themselves broke trying to compete. Which brings it back to Trump. Like Reagan, he made a promise on Iran to the American people and clearly felt bound. Redeeming that promise would be itself a boost to our credibility. It’s not just the Iranians who are watching, after all. Keeping his word is the best thing Trump could do as he pivots to Kim Jong-un. Or to Communist China or Putin’s Russia. There’s no guarantee Iran, North Korea or any adversary will fold its tent. There was no guarantee the Soviet Union would, either. After Reykjavik, it took them three years. 1. The purpose of an editorial/commentary is to explain, persuade, warn, criticize, entertain, assure, praise or answer. What do you think is the purpose of Seth Lipsky’s editorial? Explain your answer. 2. What is the main idea of Mr. Lipsky’s editorial? 4. What encourages you most about Mr. Lipsky’s commentary?